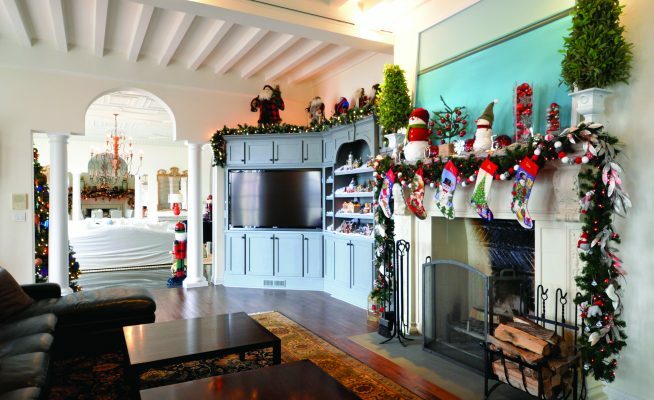 ALTA VISTA: The dining room décor is reminiscent of an Old World Christmas with a Santa Claus holding a customized list. 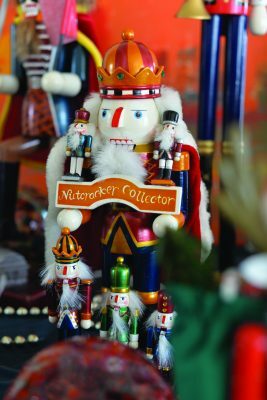 ALTA VISTA: A winter village cottage; an ornament from the storybook tree; a nutcracker from the family’s collection. 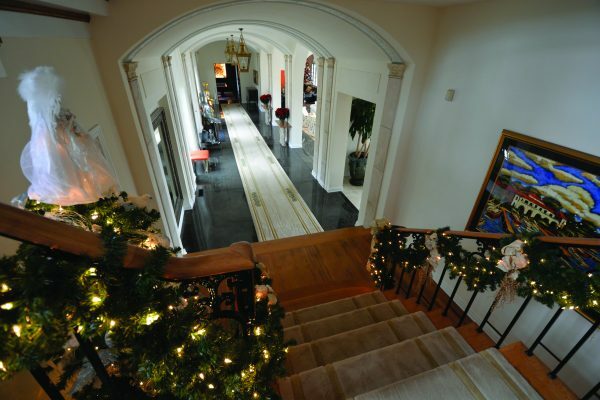 ALTA VISTA: The bannister is wrapped with garland accented with off-white and gold decorations. 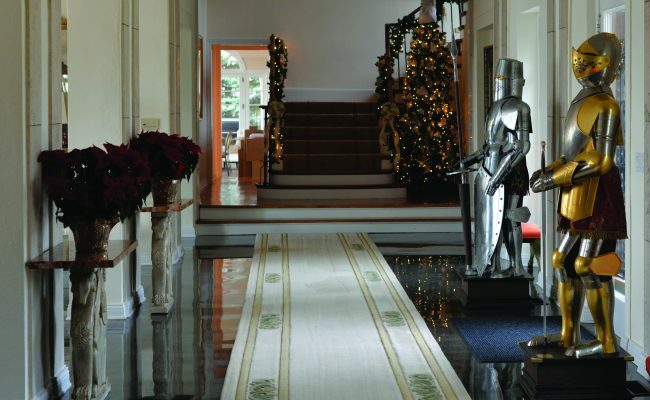 ALTA VISTA: Knights, which are reproductions of actual armor from Toledo, Spain, flank the front door in the grand hallway during the holidays. 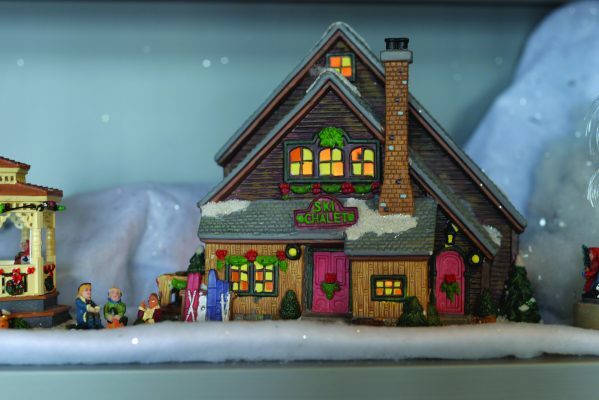 ALTA VISTA: The family room features the winter village, a Santa Claus collection, festive decorations on the mantle, along with the family’s stockings waiting for Santa’s arrival. 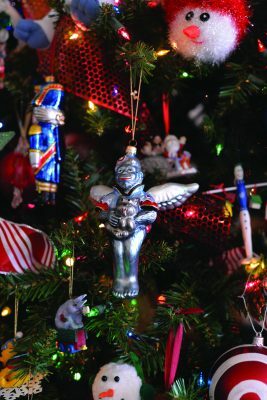 GLANWORTH GARDENS: The Great Hall is the focal point of the house and includes a 20-foot artificial tree decorated, last year, with Christopher Radko ornaments, hand blown glass ornaments, flickering 4" candles tucked throughout the tree, and sprinkled with faux snow from top to bottom. 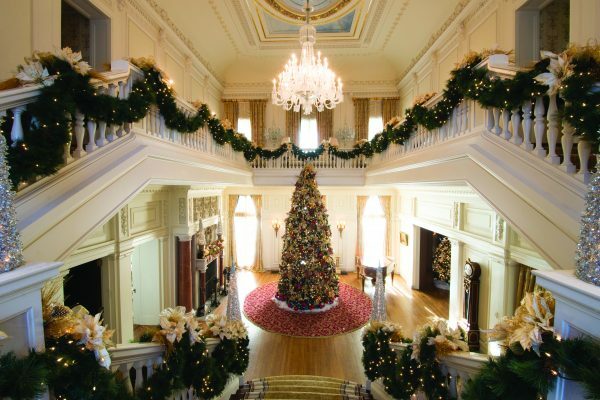 The bannister combines gold-trimmed poinsettias, gold pine branches and gold mesh. The Great Hall’s fireplace, one of 11 in the home, is decorated with gold pine boughs, red ornaments, gold and red ribbon, and a variety of ornaments. 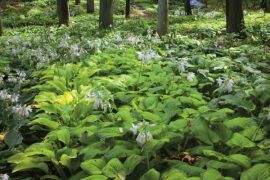 GLANWORTH GARDENS: The Christmas tree in the Great Hall can be enjoyed from the cozy, wood-paneled library, which also includes its own tree. 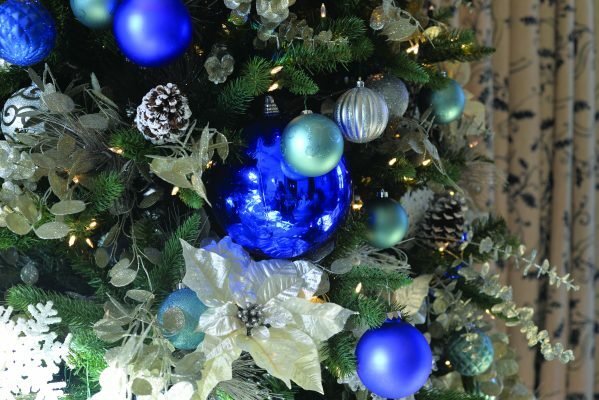 GLANWORTH GARDENS: The Victoria Old World theme is carried through to the loggia with its Christmas tree that combines blue and white ornaments that coordinate to match the predominate color scheme of the room. 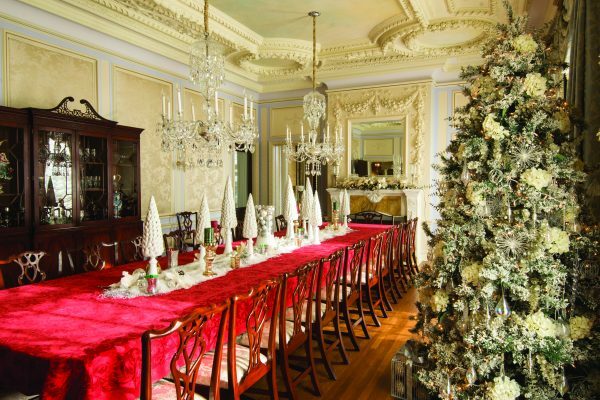 GLANWORTH GARDENS: The dining room décor corresponds with the large tree in the Great Hall. Placed upon the red poinsettia tablecloth are tapered white Christmas trees mixed with silver and white ornaments as well as white poinsettias. 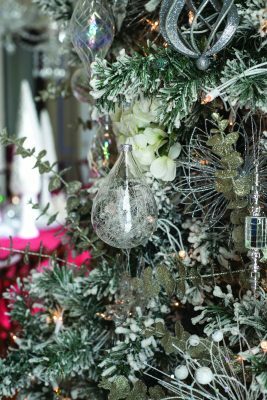 GLANWORTH GARDENS: The dining room tree is flocked to look like freshly fallen snow and decorated with white hydrangeas, eucalyptus boughs accented with silver glitter, and a combination of glistening silver and crystal ornaments. Christmastime is upon us, a season of beauty that takes over the shorter days of early winter and transforms our homes and our hearts. 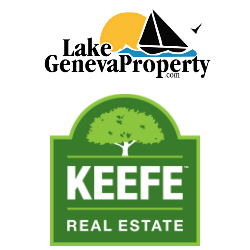 In keeping with that spirit, At The Lake presents a holiday portfolio featuring two of the most stunning estates on Geneva Lake, Alta Vista and Glanworth Gardens. We were graciously invited to visit both estates last Christmas to capture the essence of each home’s holiday décor. From twinkling lights to sparkling ornaments to whimsical family treasures, we hope you enjoy the splendor of Christmas at the lake. Alta Vista is decorated while the homeowners are visiting family for Thanksgiving. 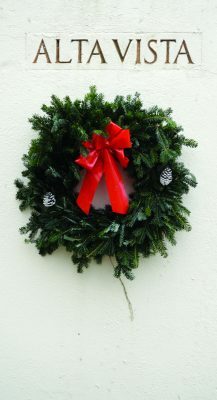 Each holiday season the home’s décor is altered a bit and new pieces are added. 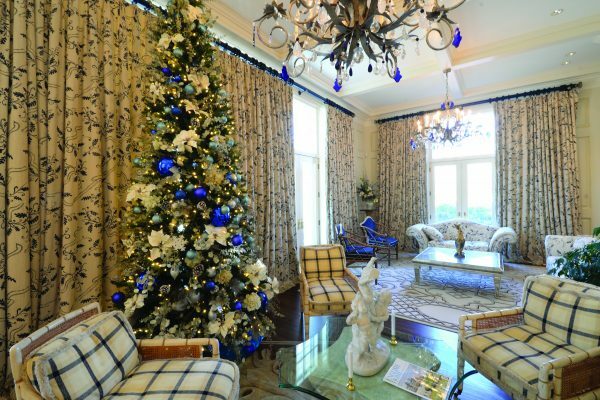 Eight Christmas trees throughout the home feature different themes. 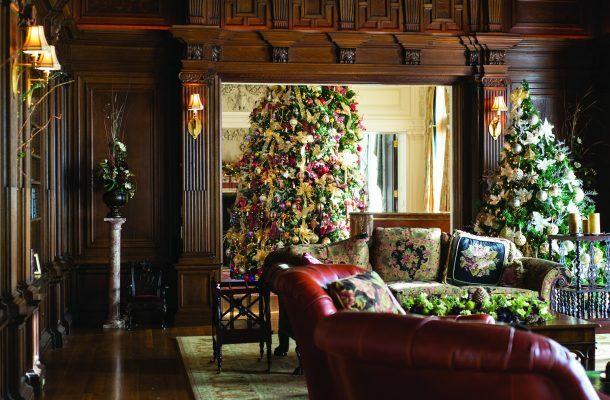 Glanworth Gardens, home to Wadsworth Hall, the distinctive Georgian Revival mansion on Geneva Lake’s north shore is beautifully decorated each Christmas by Treasure Hut Flowers of Delavan and Lake Geneva under the direction of Kevin Hermann. 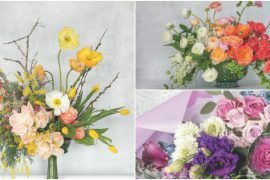 Approximately six people spend one week implementing variations of each year’s holiday theme throughout the home. Shown is last year’s theme, Victorian Old World.